1：From 9:30 a.m. through 10:05 a.m.
2：From 10:30 a.m. through 11:20 a.m.
3：From 11:45 a.m. through 12:35 p.m.
4：From 14:00 p.m. through 14:50 p.m.
5：From 15:15 p.m. through 16:05 p.m.
Up to 20 visitors can be accommodated per tour. We regret that children under the age of 3 may not participate in the tour in order to ensure safety in the factory. Please be advised in advance that the factory may not be able to meet with visitors’ preferred date and time if this slot is already booked by another tour group, due to limitations on capacity. * For details, please see the calendar included on the application form. 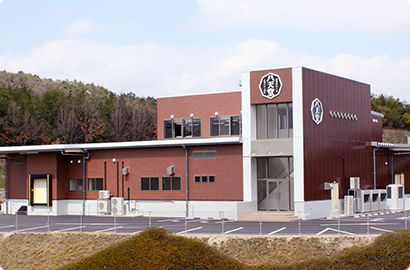 During the tour of our factory, you will be invited to enter the factory premises where Hattendo’s actual products are made. 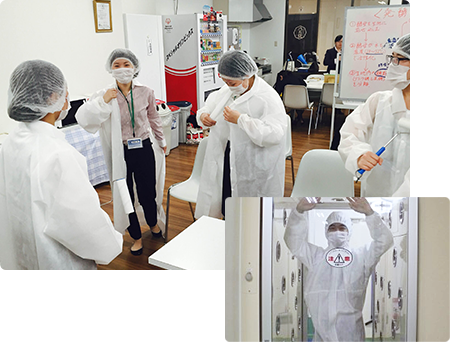 For reasons of hygiene, visitors will be requested to put overalls on over their clothing, and put on masks and gloves before entering the production area. In addition, before visitors are allowed to enter the production area, special hygiene control processes stipulated by Hattendo must be carried out to ensure that hairs and other contaminants do not get into the products. Visitors who are not wearing socks (due to wearing sandals or mules, etc. on the day of the tour) are requested to bring socks with them. In addition, visitors with long hair are requested to bring something to tie their hair back with, to prevent hairs from contaminating foods. Visitors with accompanying children are requested to bring indoor shoes and masks in their children’s size. As wheat flour, skimmed milk powder, corn starch and similar products are used in the manufacture of the products in the factory, particles of these ingredients may be present in the environment around some of the production lines. Visitors who are prone to allergies are advised to discuss this in advance with us. For reasons of hygiene, visitors are requested to leave their coats and outer garments in their vehicles. Visitors are also requested not to wear furs, artificial furs or knitted garments made with fluffy yarns, as these are inclined to shed fibers. For reasons of safety and hygiene, visitors with any symptoms of ill health such as elevated temperature, cough or stomach upset may not be permitted on the premises. Visitors are also requested to remove jewelry, watches and other accessories, as these can spread bacteria and viruses and may lead to contamination. Reservations are taken on a first-come-first-served basis. Please note that we do not have an elevator or stair lift. Be advised in advance that some transitions such as the transition to the second floor involve climbing stairs. Reservations for school trips (for social studies) are taken between 6 months and 1 week in advance. Please note that you may be touring the factory at the same time as other groups. Please arrive 10-15 minutes before the tour’s start time. Please do not bring pets with you. Please be advised in advance that Hattendo takes no responsibility whatsoever for any incidents (traffic accidents, theft or damage) taking place in the parking lot. Welcome to the Rinku Factory in front of Hiroshima Airport! You will watch a DVD that is packed with information about Hattendo’s history and the ideas that have gone into the creation of our Cream Buns. 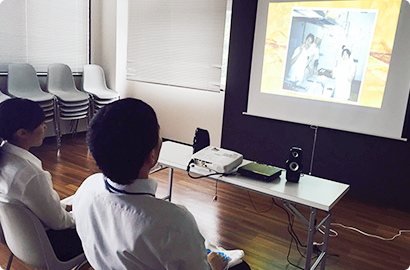 You will see many of our company’s employees in the movie! After putting on your overalls, it’s finally time to enter the production area itself! After washing your hands thoroughly and passing through the air shower, welcome to the factory! 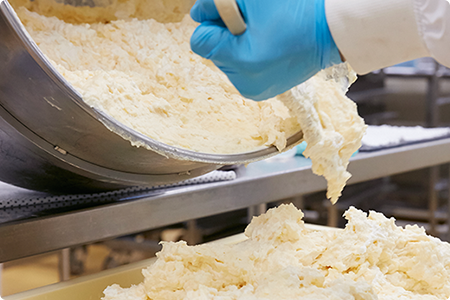 In a factory environment of complete hygienic control, the bun dough is made by mixing together flour, water, yeast, and other ingredients. 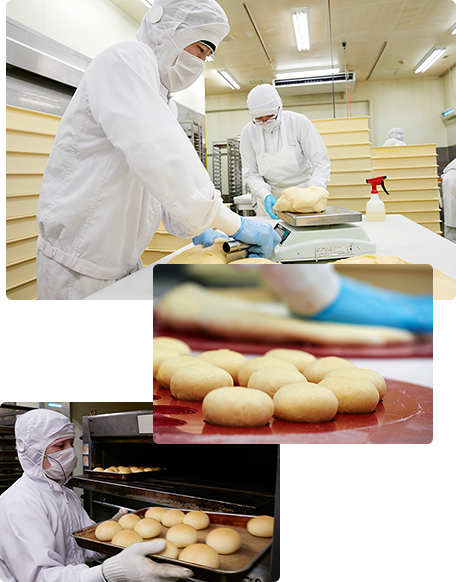 When the fresh-baked buns are taken from the oven, the factory is filled with a rich, subtly sweet aroma. 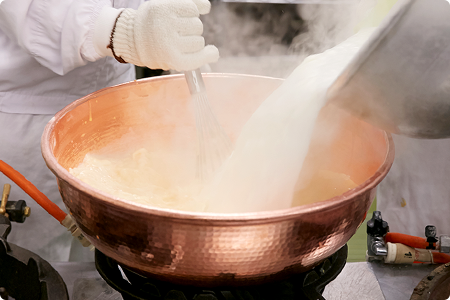 Our custard is carefully cooked in huge pans, by blending together milk, eggs and sugar. 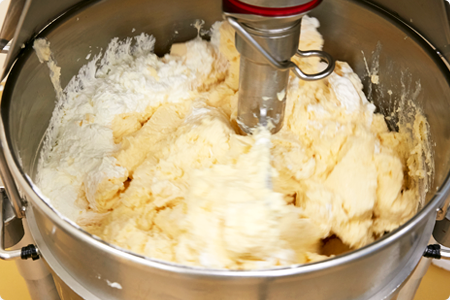 Color, viscosity, water content, and other factors are monitored carefully by human eyes until the custard is cooked. This too is a process that cannot be left to a machine. The cooked custard is mixed together with whipped fresh cream from Hokkaido to create Hattendo’s melt-in-the-mouth custard cream. The various flavored creams are made by mixing this custard cream with other ingredients such as strawberry and red bean paste. Skilled workers wrap each Cream Bun one by one at a blindingly fast pace. 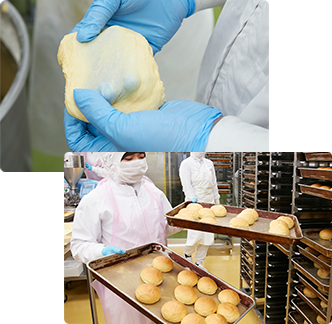 Even though the entire process is done by hand, our factory maintains a daily production volume of more than 30,000 buns. No other bakery in Japan can boast this kind of record. Visitors are invited to ask questions about anything that has occurred to them during the tour, or anything that they have always been curious about! Our tour staff will be delighted to answer your question.